There are two types of rubrics – analytic and holistic. An analytic rubric is used to assess more than one content area at different levels of performance. A holistic rubric targets a single area and is used to assess a whole work or product considering multiple factors. DePaul's Teaching Commons explaines these, as well as a subset of analytic rubrics called "developmental rubrics." And this document provides even more detail on the subsets and guides construction of the two types. 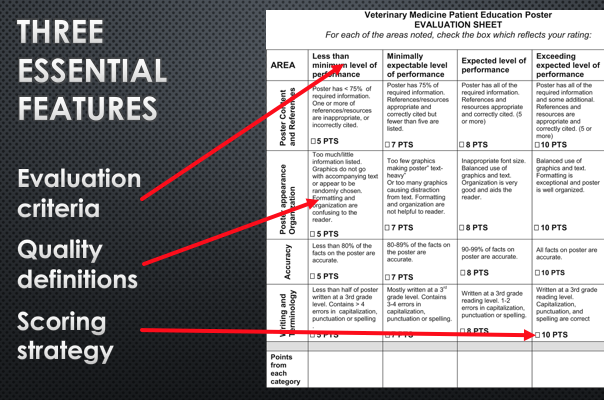 Rubric from Development of an elective course in veterinary medicine with focus in communication.